Lose That Girl: HATE IT! What's that Crunch? Nope, it's a handy snack size bag of crispy Crick-ettes. You read that right - CRICKETS! 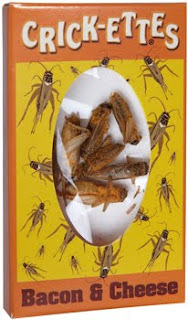 I don't think there's enough vinegar in the world to make these insect husks delectable. I'll pass, thanks. I have a strong stomach & not a lot makes me go blech! but that actually made me cringe. I'm so with you on this one. I can't see what the attraction would be for this "treat." Would make perfect party favours for a "Survivor" viewing party though.